Chard is one of those vegetables. You know the ones-if they were people, they’d be the teenagers off in a corner of the school yard by themselves, smoking cigarettes with a glare and acting like they don’t care. In the vegetable world, they’re one of those things that you look at, knowing that it’s probably really good, but you just don’t know what to do with it. Tarta, on the other hand, is president of the glee club-valedictorian, maybe even prom queen, never wears the same thing twice, and the type of person you’d really love to hate-if she weren’t so gosh-darn nice! No, tarta is easy to make, fast, and can be filled with just about any filling you care to use-basically your all-around goody two shoes. Preheat the oven to 350 degrees Fahrenheit. Heat the oil in a large skillet over medium high heat and saute the onions until translucent. Wash the chard very well (grit is common!) Remove the hard stems of the chard, and chop coarsely. Add the chard to the onions with a couple tablespoons of water and a little salt, and cover, steaming until wilted. Add the pepper and cheese and mix well. Heat through until the cheese is melted. Remove from heat and let cool slightly. Drain off any liquid. Put 1 pie crust onto a round (pizza) pan. 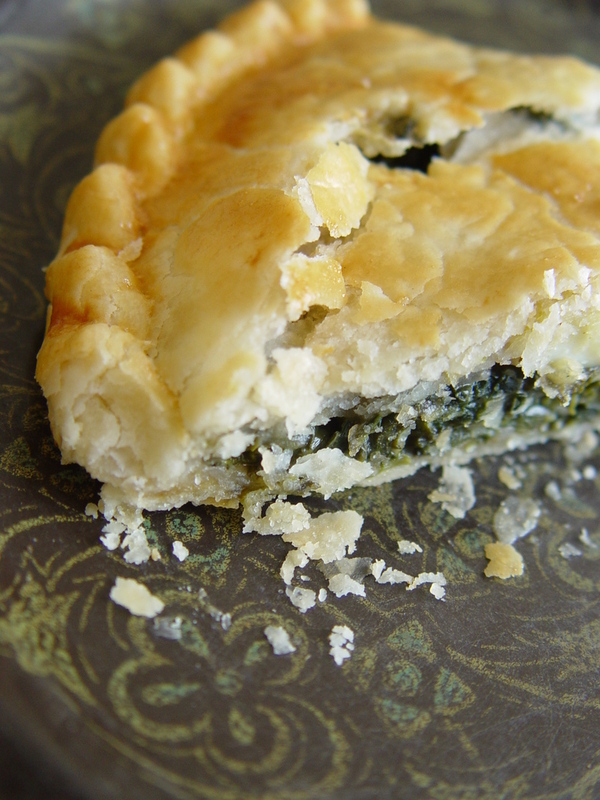 Put chard mixture onto the center of the pie crust. Arrange slices of egg on top of chard mixture. Cover with second pie crust round and seal the edge all the way around by twisting the dough, so that none of the filling seeps out during baking. Bake until crust is golden brown, about 35-40 minutes. Cut into wedges. It can be served hot, cold, or at room temperature. I have so been meaning to make Pastel de Acelga. You just seem to beat me to things too often. Maybe we should do some things at the same time with the Peruvian and Argentinean version. Hmmm…. This looks terrific. I liked the pastels when I was there. Yum! What a beautiful day and what an amazing recipe! thanks so much for these interesting and delicious entries! This looks wonderful! It also reminds me of something that moms used to make for picnics in southern Russia when I lived there. I’ve promised to get more dark leafy greens into our diet. This looks like a wonderful way to do it — a bit sneaky, underneath all of that luscious pastry and with cheese, too! Gretchen-yes, we should collaborate and do a recipe post together! Love the idea! Kitchen Goddess-yes-by a month from now it will be growing out of control. Good luck! Oh, and thanks for the award! Jen-I wonder if it IS Russian in origin? My mother in law is Ukrainian, and there are many Russian immigrants in the area that my husband is from! Where did you live? Lydia-it is a good sneaky way-and those dark leafy greens are tough to squeeze in! That tart looks perfectly golden brown and good. I am constantly wondering what to do Swiss Chard and this sounds like a great way to use it. 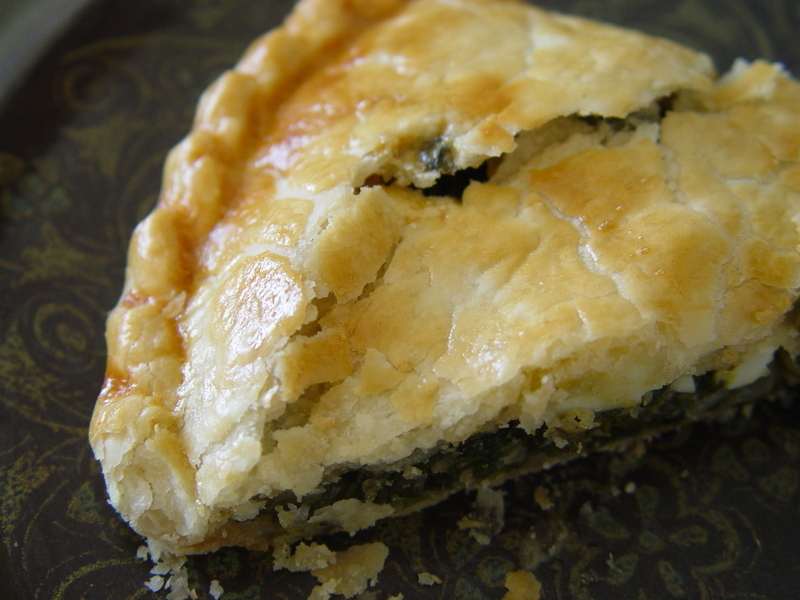 I remember this Argentinian lady made us a pie which look something like this. But she put ham,eggs, corn and spinach in it. It was delicious. Thanks for sharing this recipe and I will definitely make this for Carlos Do you mind if I link you to my blog? I was wondering what acelga was. I knew it was greens but didn’t know it was chard. A lot of the tartas de acelga I’ve tried are bland. I bet some vineagar would zip it up a bit. Marido and I douse our slices with hot sauce (crass, I know). Any other ideas? Yum! This looks absolutely delicious! Here, chard is commonly used in soups (potaje), especially “Caldo Gallego,” which is chard with white beans, bacon, and a bunch of other stuff. Kevin-I hope you try this out-it’s a great way to use chard! Gertrude-That tart *sounds* delicious! I’ll have to ask Guillermo if he’s ever had anything like it. Thanks for linking to me! Mandy-I know what you mean-I think the trick to acelga is the homemade and fresh factor. But what about crushed red pepper? (aji molida)That would give it some zip, or maybe goat’s cheese instead of mozzerella? Yum! Canary Girl-Caldo Gallego sounds almost like an Italian soup (whose name I don’t know) that my mom makes-tasty! Do you have the recipe? this looks delicious. I’m definitely going to try the recipe. Congratulations on your award on the food network! Great recipe and website! I was looking for a recipe for pascualina and used yours with some small modifications. Thanks!